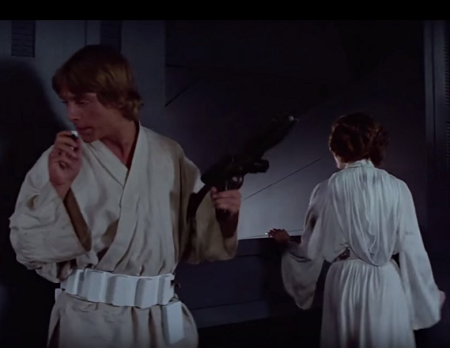 In A New Hope Detention Center Shoutout scene Luke is clearly shooting with his left hand. Later in this same video at 4:51 he makes a leftie shot more clearly. 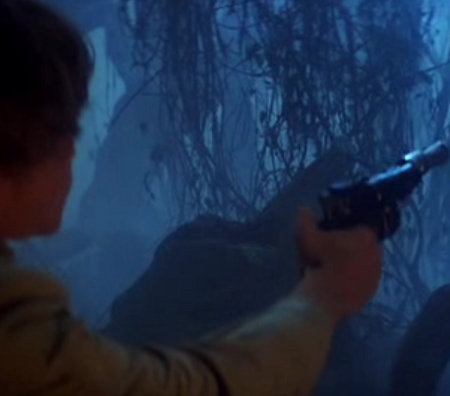 In The Empire Strikes Back while following Boba Fett, Luke holds a gun (and subsequently shoots) with his right hand. Needless to say, while fighting with a lightsaber he also uses his right hand. 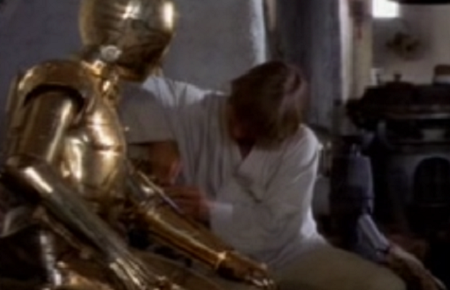 So why did he shoot with his left hand in A New Hope? 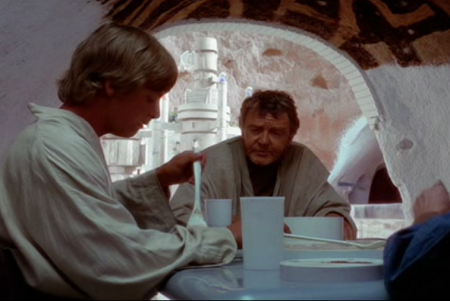 Luke is pretty consistently shown to be ambidextrous (having the ability to use both hands without favouring one) throughout the original trilogy film series. In A New Hope he totes a gun and shoots with his left hand while on the Death Star. He ladles food onto his plate with his left and then passes a heavy jug from his right hand to his left to pour. He uses a screwdriver with his right hand. 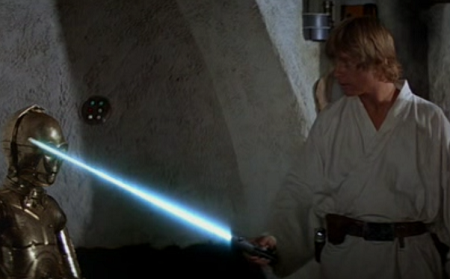 He handles the lightsaber with his right hand. 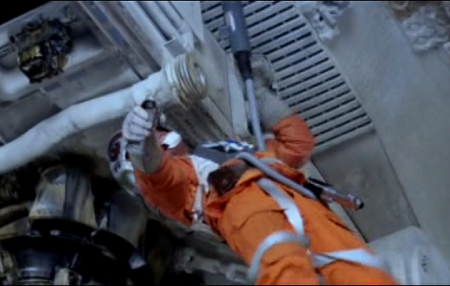 He favours his right hand for throwing a grenade in Empire Strikes Back. 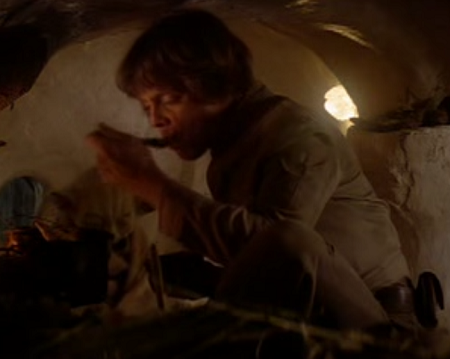 He eats with his right hand in the swamps of Dagobah, as well as pulling a gun with his right. But then eats with his left hand a few minutes later. 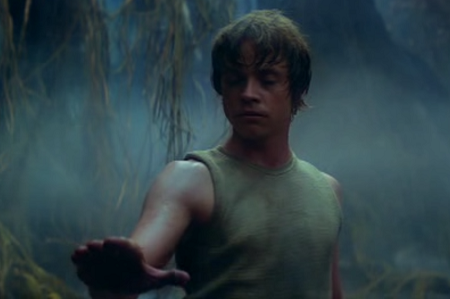 He favours his right hand for reaching out with the Force. He totes his gun in his right hand on Cloud City. 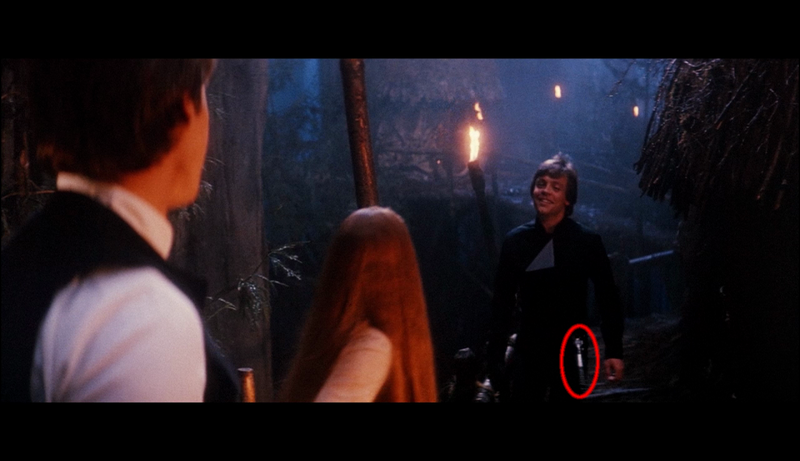 He throws a skull with his left hand in Return of the Jedi. 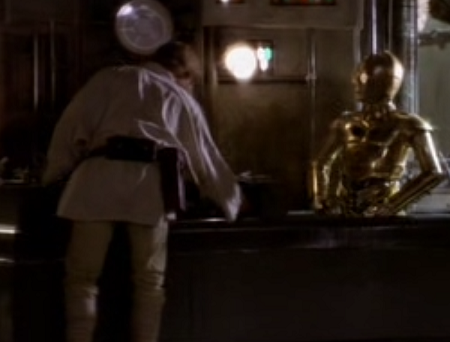 He salutes Jabba and catches his lightsaber with left hand. He calls the lightsaber to his right hand and fights almost exclusively with his right. 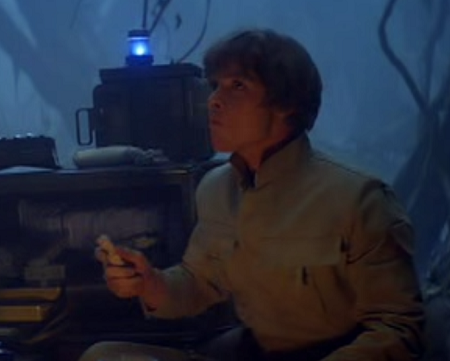 It's not clear if this was an intentional directorial choice, a goof (reversed plates meant that Fett's antenna swapped sides repeatedly during the Skiff scene and Luke's lightsaber would repeatedly jump from his left to his right hip, for example) or whether Lucas simply didn't notice or care that his main actor (who's left-handed in real life) was using his hands interchangeably. 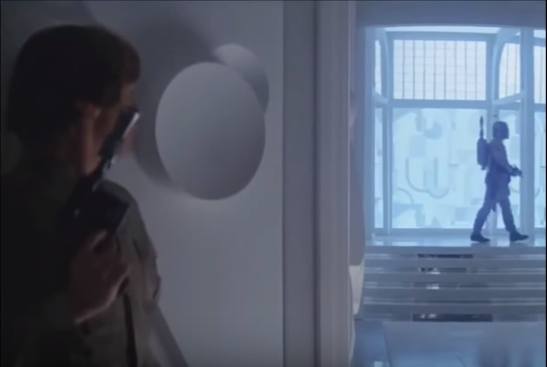 During the Detention Centre shootout, Luke is taking cover on the right-hand side of the corridor (from his perspective) and the alcove he's using for cover would make it harder to fire his blaster right-handed. He's trying to stay behind that little bit of bulkhead as much as he can to avoid the incoming Stormtrooper fire, so holding the blaster in his right hand would mean having to lean farther out to get a shot off and making himself more of a target. 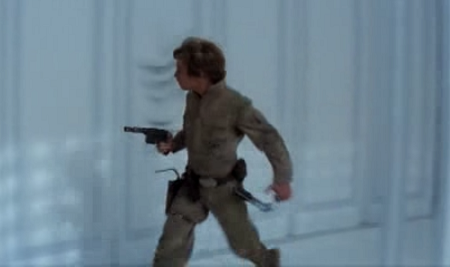 In Cloud City, you can see that Luke's hiding behind a wall at a left-hand turn (his perspective), so naturally he wouldn't need to shift his sidearm to another hand since he'd still be in cover if he decided to lean out and shoot at Fett and the Imperials. EDIT: Several comments have indicated that Mark Hamill is left-handed, while I've also seen that Luke may be intended to be ambidextrous with a preference for one hand or the other depending on the action. But in terms of in-universe actions, Luke's simply taking best advantage of his cover the same way that Han and Chewie are shoving themselves up against the wall in the Detention Centre. As a side note, you'll sometimes see Stormtroopers carrying their blaster rifles left-handed; this was because the Sterling submachine guns used for the blank-fire props have a VERY awkward horizontal magazine that sticks out of the left side of the gun and makes it difficult to hold in the typical "Stormtrooper Ready" position, even with a chopped-down 10-shot magazine. As a left-handed person myself, who has some shooting experience with hand-guns and rifles, I can say with some certainty that left/right handedness doesn't always correlate to which hand you hold the weapon in. When I hold weapons, my right hand is the trigger-holding hand, and my left is the support hand. For racquet sports, I'm fully left-handed as there's no dependency on eye dominance. Binocular vision facilitates the estimation of distance, speed and angle and helps one to gain the full benefits of natural hand to eye co-ordination. If you doubt it, try catching a ball with one eye shut. But, do not believe those who say simplistically that everyone should shoot with two eyes. It’s not as simple as that. Absolute dominance in the eye looking down the rib – keep both eyes open and focus locked on the bird, the bird and nothing but the bird. Predominant dominance (one eye is predominantly but not fully dominant) in the eye looking down the rib – keep both eyes open with appropriate cast, or, squint an eye as the gun comes to the shoulder or otherwise block the vision to it. True cross-dominance (eg right-handed but left eye dominant) – squint/close opposite eye, block vision to it, use a full crossover stock, or change shoulders. Intermittent or occasional cross-dominance – probably caused by poor focus discipline or bad gun fit. Consider what rib picture you can see when the gun is mounted at 45 degrees with normal cheek pressure. Central vision (neither eye dominant) – close eye opposite rib, block vision to it, consider acquiring a semi-crossover stock. Indeterminate dominance – both eyes fighting for control, close eye opposite rib or block vision to it. Stormtroopers obviously suffer from any one of the last three variants of eye-dominance. Not the answer you're looking for? Browse other questions tagged star-wars a-new-hope the-empire-strikes-back or ask your own question. 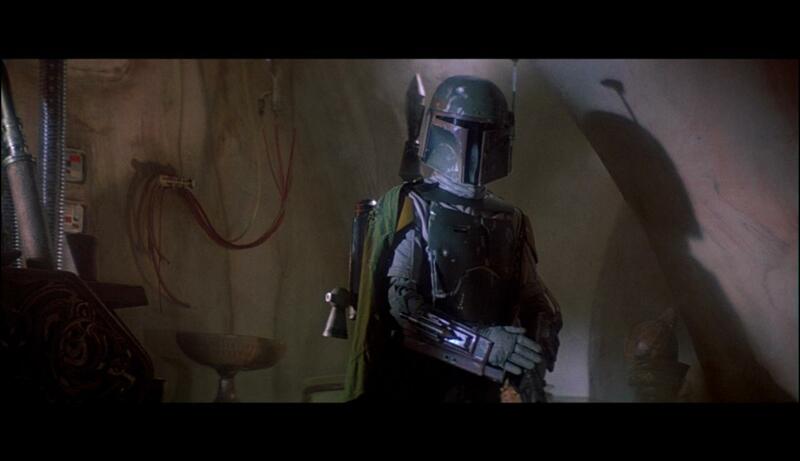 Why does Darth Vader stop Boba Fett from shooting Chewie in The Empire Strikes Back? George Lucas has so much to say on the topic of Han shooting Greedo but doesn’t say squat about Luke kissing his own sister? When and how does the Emperor learn that Luke is Vader's son?